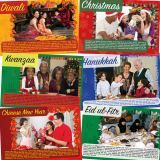 Celebrate various holidays and celebrations with this set of 6 posters. Includes Diwali, Christmas, Kwanzaa, Hanukkah, Chinese New Year and Eid ul-Fitr. Available only at Sonsuh Educational Supplies.